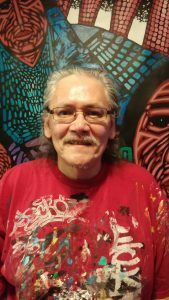 Jerry Whitehead is a Cree artist from the James Smith First Nation, Saskatchewan. Jerry received a Bachelor of Arts at the University of Regina (Indian Art-S.I.F.C) in 1983 and a Bachelor of Fine Arts from the Nova Scotia College of Arts and Design in Halifax in 1987. Jerry lives and works in Vancouver, B.C. He has been painting for the last 40 years and have been involved in numerous public art projects over these years. Jerry has been an Artist in Residence with the Vancouver School Board for the past five years, and has an extensive knowledge of all aspects of murals.